Prof. Guoqing Hu at the State Key Laboratory of Nonlinear Mechanics and his colleagues have made progress in formation mechanism of pulmonary surfactant (PS) corona on nanoparticles (NPs). They studied the interaction between the inhaled NPs and PS in the alveolar fluid and found that structure and molecular conformation of the PS corona depend on the hydrophobicity of the pristine NPs. The results are published as a full paper titled "Unveiling the molecular structure of pulmonary surfactant corona on nanoparticles" in ACS Nano (2017, 11: 6832-6842). The paper's co-authors are Qinglin Hu, Xuan Bai, and Prof. Guoqing Hu from the Institute of Mechanics, and Prof. Yi Zuo from the University of Hawaii. With a larger surface free energy than the bulk material, NPs immediately adsorb biomolecules upon contacting biological specimens to form the so-called biomolecular corona. Biophysicochemical properties of this corona, instead of the pristine NPs, determines the biological identity of the NPs when further interacting with the biological system. Numerous studies have shown that the biomolecular corona alters the biodistribution, bioreactivity and biopersistence of NPs, thus resulting in differential cellular uptake and biological effects of the NPs. To date, a majority of studies in the biomolecular corona focuses on the protein corona formed by the interaction between the NPs and the plasma proteins. Although the lung is the most susceptible to particle invasion due to its large surface area in direct contact with the environment, relevant studies on pulmonary surfactant coronas are very scarce. Using coarse-grained molecular dynamics simulations, the authors studied the interactions between NPs and the natural PS in the alveolar fluid. It was found that regardless of their physicochemical properties, upon contact with the PS, both Ag-NP and PST-NP instantly acquire a biomolecular corona that consists of both lipids and proteins. Structure and molecular conformation of the PS corona, however, depend on the hydrophobicity of the pristine NPs, with the hydrophilic Ag-NP forming a bilayered corona and the hydrophobic PST-NP forming a monolayered corona. The PS corona provides the NPs with a physicochemical barrier, equalizes the hydrophobicity of the pristine NPs, and may enhance biorecognition of the NPs. These modifications in physicochemical properties will play a crucial role in affecting the biological identity of the NPs and hence alter their subsequent interactions with cells and other biological entities. It is thus suggested that all studies of inhalation nanotoxicology or NP-based pulmonary drug delivery should consider the influence of the PS corona. 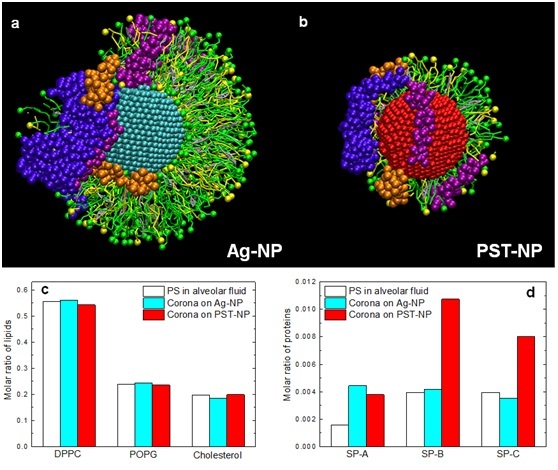 The referees gave very positive comments on this work: "These results introduce new definition, a pulmonary identity of nanoparticles, which may have profound effects in the field of nanobio interfaces, nanomedicine, and nanotoxicology" by one, and "The paper is the most thorough simulation of nanoparticle interactions with lung surfactant components that I have seen and appears to be well designed and interpreted according to experimental findings" by another. This work was supported by National Natural Science Foundation of China, the CAS Key Research Program of Frontier Sciences, and the CAS Strategic Priority Research Program.